September 16, 2018 - For the the 5th year in a row, the TCN Band placed 1st place at the Preble County Pork Festival Parade! May 17, 2018 - The 2018-2019 Field Commanders are Madison Cox and Megan Herbert. Congratulations! May 5, 2018 - Congratulations to the TCN Concert Bands for their performances at today's Music in the Parks Festival! The Junior High Band received a Good rating and came in second place in their division. The High School Band received an Excellent rating and came in first place in their division. March 10, 2018 - Congratulations to the High School Concert Band for their Excellent rating in OMEA District Competition! They received a superior in sight reading, and in the performance, one judge rated a superior, one an excellent, and one a satisfactory, for the average of the Excellent rating. May 23, 2017 - The 2017-2018 Field Commanders, back for their 2nd year, are Megan Herbert and Kasidi Meyers. Congratulations! May 6, 2017 - Congratulations to the TCN Junior High concert band for receiving an Excellent rating and placing 3rd at the Music in the Parks competition. Congratulations! March 3, 2017 - CONGRATULATIONS to the TCN High School concert band for receiving an Excellent rating at the OMEA District Competition! ON SATURDAY, MAY 7TH, BOTH THE TCN JUNIOR HIGH AND HIGH SCHOOL CONCERT BANDS PLAYED IN THE MUSIC IN THE PARKS COMPETITION. THE JUNIOR HIGH BAND CAME IN FIRST PLACE AND RECEIVED AN EXCELLENT RATING. THE HIGH SCHOOL BAND CAME IN FIRST PLACE, RECEIVED A SUPERIOR RATING, AND WAS SELECTED AS BEST OVERALL BAND. 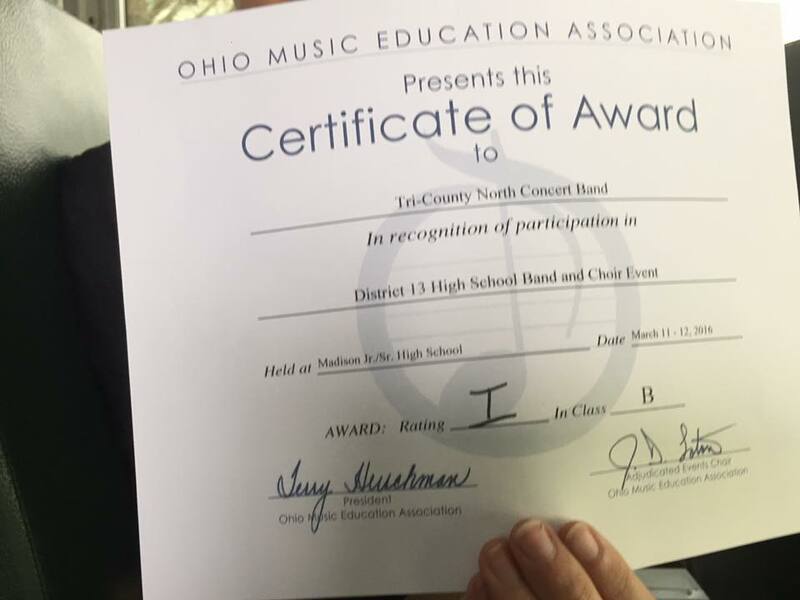 CONGRATULATIONS to the TCN High School concert band for receiving an Excellent rating at the OMEA State Competition on April 30th. This is the first time in 36 years that the band qualified to compete at this level. The TCN High School Band received an Excellent (II) rating at the state band competition, performing class B music. We're just too big to fit in one picture. Congratulations to Michaela Manning and Bethany Salyers for receiving Excellent ratings at the OMEA Solo & Ensemble Competition! 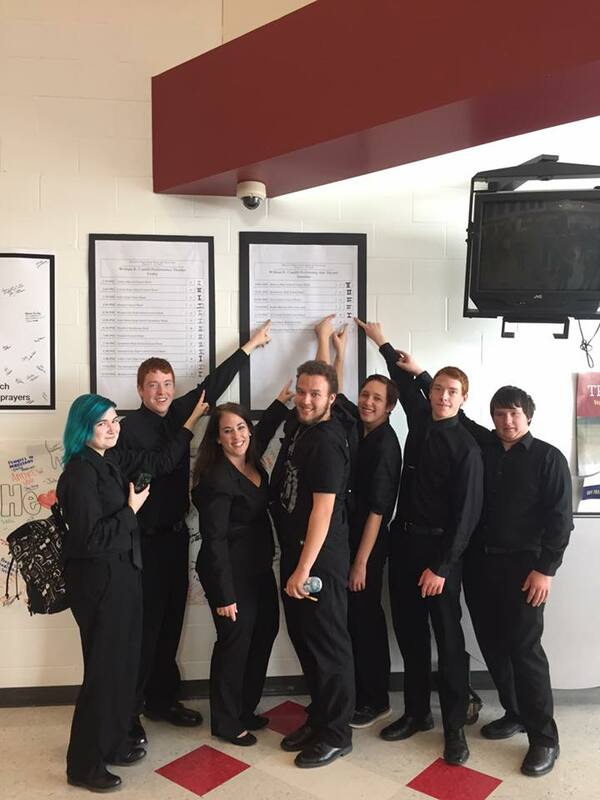 On March 12, 2016, the TCN High School Concert Band received a Superior (1) rating at the OMEA District 13 competition. This rating allows the band to compete in the State competition on April 30th. They will be competing at Troy High School, 151 Staunton Road, at 2pm.